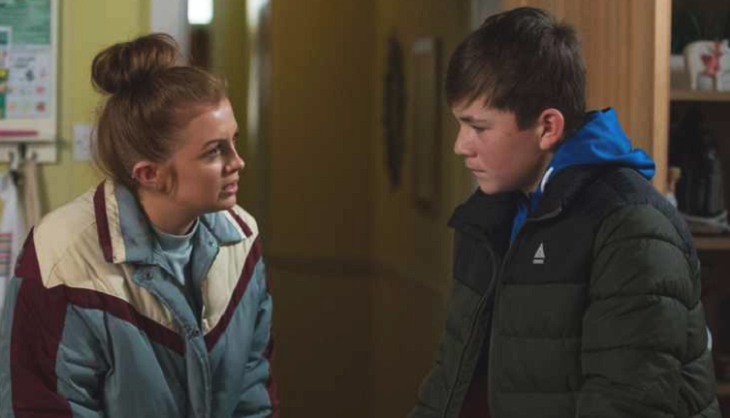 Now that Evie Steel (Sophia Capasso) is under witness protection, Tiffany Butcher (Maisie Smith) tries to get her life back on track on EastEnders. She turns to her uncle Jack Branning (Scott Maslen) and the rest of her family for support. But the once troubled teenager faces another dilemma in form of Dennis Rickman (Bleu Landau). She was starting to open up about what happened to her and admitted she was raped by a gang member during the time she ran away from home. She gets hold of information that Dennis contacted dangerous dealer Stix. Tiffany tries to prevent him from meeting up with Stix, so she asks him to come over and hang out. However, Dennis overhears her and Sonia Fowler (Natalie Cassidy) joking about when she was babysitting him. He feels patronized, so he gets in touch with Stix for a meet up. He manages to sneak off and even lies to his mom, Sharon Mitchell (Letitia Dean) as to where he is heading. Sharon was furious when Dennis said he couldn’t attend the family affair but still lets him go, believing that he was meeting a friend. Tiffany eventually figures out what Dennis is up to. In an effort to save the kid from making a terrible mistake and from getting himself in grave danger, Tiffany heads over to the Mitchell’s and exposes Dennis’ drug secret. Despite her good intentions, Sharon gets furious at her after finding out she was the one who introduced Dennis to the gang in the first place when, she was still being manipulated by Evie. EastEnders viewers may recall that Tiff brought Dennis to meet the gang a few months back. Sharon got into a heated argument with Sonia and Whitney Dean (Shona McGarty) when both girls tried to defend Tiff. Sharon accused Tiff of grooming Dennis and blamed her for what is happening to her son. Fortunately, Jack was there to warn Sharon off. She tries to get Dennis to open up but he clapped back, saying she never cared. Phil accuses Sharon of being too soft on Dennis. Desperate to help their son, Sharon and Phil decide to use a tougher approach. The question now is if this will work or will it make things worse for Dennis. General Hospital Casting Rumor: Is Cady McClain The New Nina Reeves?